Boston, MA, April 26, 2018 – Synova Associates, LLC, in partnership with March of Dimes, announce that Luann Jones, Neonatal Services Nursing Director at Arkansas Children’s Hospital, is this year’s recipient of the March of Dimes Excellence in NICU Leadership Award. 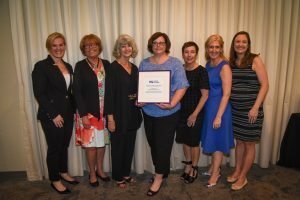 The award was presented to Ms. Jones at the annual NICU Leadership Forum, held in Ponte Vedra, Florida on April 22-26, 2018. The award recognizes the significant contributions of NICU leaders. “Past winners of this coveted award have all demonstrated the highest level of inspiration and support to their staff and this year’s winner truly exemplifies those qualities and more,” said Chrissy Burke, partner, Synova Associates, LLC. Criteria for the award include a demonstration of a strong leader with ability to influence staff within and beyond the NICU, and to lead with care and compassion towards patients, families, colleagues, and staff. “I know it sounds corny, but I was inspired to choose nursing as a profession because of my son Drew’s primary nurse in the NICU at Arkansas Children’s Hospital. That NICU nurse went well beyond providing quality care to my premature baby. That entire experience set me on the path to become the best NICU nurse I could be,” said Ms. Jones. The theme for this year’s NICU Leadership Forum was “Leadership: Finding Joy in the Journey.” For the 22nd year, Synova Associates attracted close to 200 nurse leaders from around the country to participate in educational leadership conferences, presentations, round-table discussions and networking opportunities.